It is not enough to enjoy the beauty of a garden. We need to believe that it hides fairies. 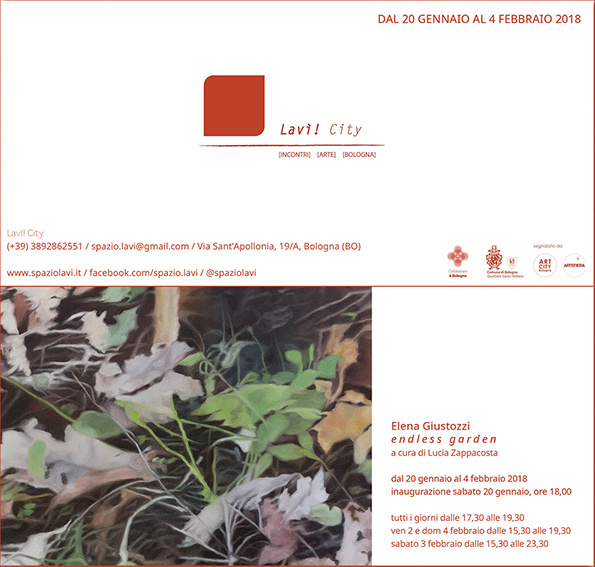 Elena Giustozzi shows, with her accurate and elegant work, that a painter can observe, conceive, organize and build the knowledge of the contemporary world through the imperturbable scale of monumental painting. 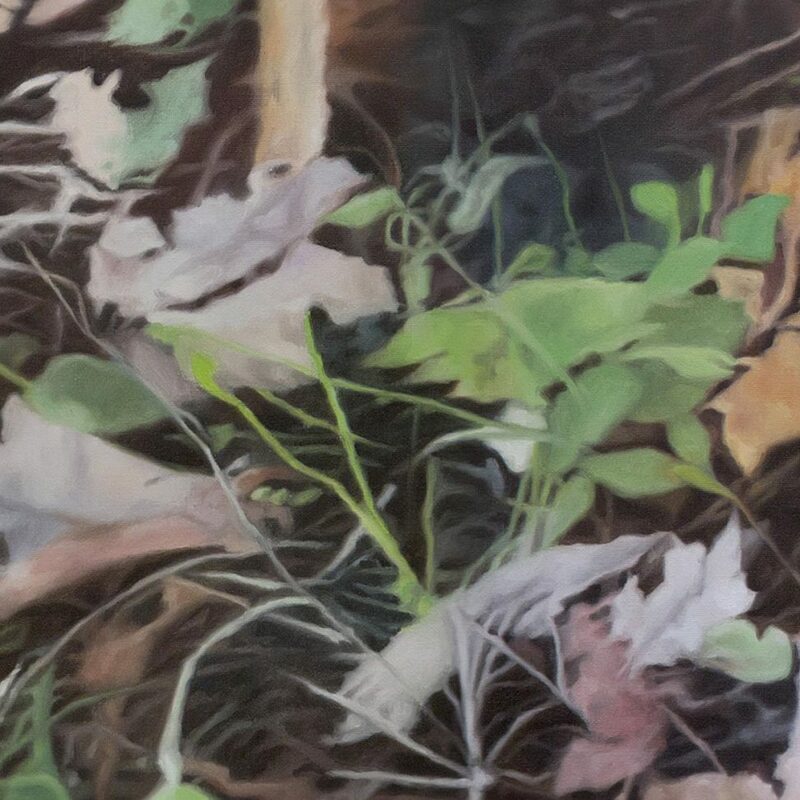 Just as the painters of the past found their subjects in daily life, Elena Giustozzi also gets inspiration from her personal visual experience and from the emotional selection of natural elements. extrapolating a documentation of nature in which analysis and intuition, logic and beauty, memory and image overlap. The garden fascinates the artist not only for its nutritive, regenerating, healing qualities but also for its subversion. Beyond the closed and organized space, the garden is a harbor of fragmented, undisciplined and endless private emotions. It is the place of resistance and dissidence, of the most exquisite refinement as of the wildest exuberance that becomes a biological, ethical and political laboratory. The works created for this exhibition create an organic, terrestrial and solar scenario that presupposes an expansion of the image and time as in a filmic sequence. The visitor is invited to enter this immersive, enveloping “tape” installation, with the joy of a young explorer to which is offered an imaginary path made of small universal clues, in a still image of fragments to be contemplated. Imagined as a territory without boundaries, the work, composed of several paintings connected together to form a single work, faithfully reproduces the details that make up reality and expands itself beyond its physical boundaries to describe the contours of a dark, chaotic experimental and unpredictable garden observed through an imperfect frame. The removal of the specific identity to portray represents nature in the perspective of a metaphorical spring. The artist hides herself behind an almost casual vision pursuing the target of creating “an encyclopaedia of life”, a neutral pictorial stage on which stand out hyperrealistic still lifes, represented minutely and which are fixed on the canvas as botanical specimens. life. Elegantly laconic, they blend the perpetual motion of existence with the stasis of metaphysical reflection, exploring in the last analysis more complex and universal themes, such as appearance, perception, the purpose of the world and of our evanescent and transitory presence in it.